You will earn 425.02 Reward Points. Earn 1 reward point for every 1 dollar spent. 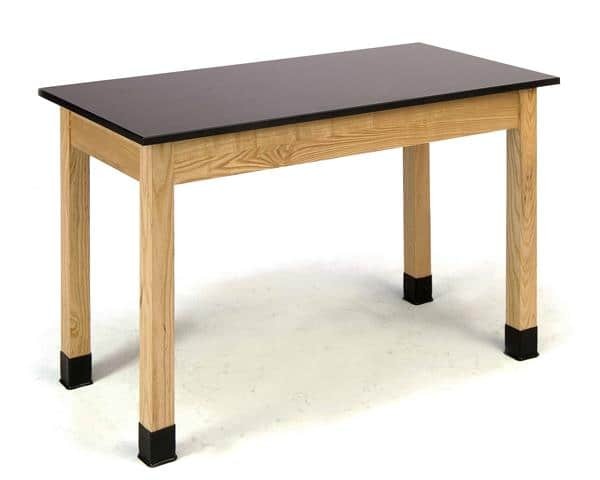 The brand-new Phenolic Science Lab Tables will have "perfect chemistry" with any science classroom. These paragons of endurance are built with strong ash frame and side panel aprons beneath a solid, black, phenolic resin tabletop with a matte finish. The work surface is crack-resistant and can be modified using carbide-tipped tools. It is impervious to extreme cold, heat up to 275° F as well as damage from virtually any chemical, acid or possibly corrosive substance that may be found in a laboratory setting. Robust legs are spot-welded to the frame with metal-on-metal double-bolts on 13-gauge steel corner braces for maximal stability. The PSLT's feet are outfitted with rubber liquid-protective boots and adjustable glides for accurate floor leveling. This product meets or exceeds SEFA environmental industrial standards.